Do you know any Australian films? Or maybe you know some famous Australian actors or actresses. The Australian film industry started in 1906 with the production of the first Australian film. Since that first film, the Australian film industry has had some ups and downs, including a period in the late 1950s and early 1960s where it almost came to a halt. In the early 1970s the Australian government offered funding assistance and created the Australian Film, Television and Radio School. From there Australian films and Australian film making has gone from strength to strength. When I was a teenager, I can remember thinking that Australian films were not the same quality as films from Britain and America. We were used to hearing British and American accents from the actors and actresses. The Australian accent seemed strange and almost out of place in a film. But that has changed. Since that turning point in the early 1970s, the quality of Australian films and our performers has improved steadily and is now recognized as right up there with the best from other parts of the world. What’s more, Australians now want to see Australian films. I’m sure you’ve heard of great Australian film performers like Nicole Kidman, Cate Blanchette, Heath Ledger, Hugh Jackman, Mel Gibson, Naomi Watts, Russell Crowe, Eric Bana, Toni Collette and Geoffery Rush – just to name a few. And I wonder if you have seen such great Australian films as Mad Max, Crocodile Dundee, Muriel’s Wedding, Shine, Moulin Rouge, Australia and Animal Kingdom – again, just to name a few. I still love to watch movies from abroad. In particular, American and British films continue to be very popular with Australian audiences. However, it’s great when I can watch a film where the actors speak in an accent just like my own and where the stories and places are about things that make sense to me as an Australian. I think most Australians feel the same. There is one Australian film I would like to tell you about. For me, it somehow captures what Australia is about. To me, Australia is about giving everyone a fair go. That’s really what this film is about. This film is called The Castle and it was made in 1997. The film had a low budget of only $750,000. It was very successful in Australia and New Zealand, grossing more than $10 million in ticket sales, although it was not widely distributed outside of Australia. $10 million is a fantastic return for an investment of only $750,000. What’s more, the film was written in just two weeks, filmed in only ten days and ready for final editing in another 2 weeks. That compares with big films today which can take years from idea to completion. I think because of the speed in which it was made and it’s low budget, it somehow produced a simple but very powerful story which captured something typically Australian – the idea of a fair go. I absolutely love the film and have watched it many times. It makes me laugh and it has sad parts as well. It has a happy ending and it always puts a big smile on my face. Somehow it makes me feel good about being Australian. It was written by Santo Cilauro, Tom Gleisner, Rob Sitch and Jane Kennedy, and was directed by Rob Sitch. In my opinion, they are very talented people. Here’s a synopsis of the plot. Darryl Kerrigan is a tow truck driver who lives with his wife and two older teenage children in a blue collar suburb right next to the airport. Darryl also has two older children, one a girl who has just got married and the other an older boy who is in jail for robbery, a fact that Darryl is very sad about. Their home is a very modest home with somewhat tacky styling and furnishings. None the less, Darryl and his family love their home and all the wonderful memories it holds for them. One day, a valuer knocks on the door and says he wants to value Darryl’s home. Darryl is not aware that a very big company wants to ‘compulsorily acquire’ their home and land, along with those of the people who live around Darryl, in order to expand the airport. ‘Compulsorily acquire’ means that Darryl and his family will have no say and no choice. The big company will take their home and they will be forced to leave. They will be paid ‘compensation’, which means they will be paid an amount for the house which the company thinks is fair. But Darryl doesn’t want their money, not even when they increase their offer, their compensation. He wants to stay in the house where he and his wife raised their family and lived happy lives. Darryl obtains help from a local lawyer called Dennis Denuto. The problem is, Dennis is not a very good lawyer. He helps Darryl go to two different courts, including the Federal Court, to try and get the compulsory acquisition stopped. But each court rejects the request. Dennis’s argument in that it is unfair on Darryl and his family, and that Australia’s constitution says it is unfair. He argues it is ‘the vibe’ of the constitution. This is a hard word to explain but it means the theme or real meaning of something. The problem is, Dennis doesn’t really understand this area of law or the constitution. So Darryl’s request gets rejected. However, while at the Federal Court, Darryl meets an older man called Laurie who is actually a retired lawyer, a QC or Queen’s Counsel. Being a QC means he is a lawyer who is very highly skilled, very experienced and who charges very high fees. In other words, he is one of the best lawyers in Australia. He hears about Darryl’s problem and offers to help Darryl, free of charge. But they have to go to the highest court in the land, the High Court in Canberra. The film shows how they argue their case in front of 3 High Court judges and how Darryl’s case is finally won. What a victory, a victory for the small person over a big company, which proves that even if you are large and powerful, you must still treat others fairly. I can highly recommend this film. Be aware however, that it does have some explicit language and is not suitable for children. Podcast 38 Quiz - Did you understand the podcast? You make take the quiz as many times as you like. An individual’s scores are not recorded. True or False? – When Rob was a teenager, he thought that Australian films were of high quality. True or False? – Rob doesn’t like to watch films from abroad. True or False? – The film called The Castle is about giving everyone a fair go. True or False? 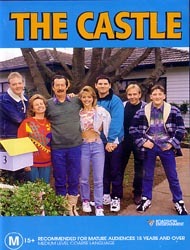 – The film called The Castle was written quickly and gave a large return on investment. True or False? – The film makes Rob feel sad about being an Australian. True or False? – In the film, Darryl Kerrigan lives in a home which has very beautiful furniture. True or False? – In the film, a big company wants to take Darryl Kerrigan’s home away from him. True or False? – In the film, Darryl goes to court to try and stop the compulsory acquisition of his home. True or False? – A QC called Laurie helps Darryl to go to the High Court of Australia, in order to stop the compulsory acquisition of his home. True or False? – The film is not suitable for children. because i will come to Australia to study master but i have to study English before the master. i used to listen to American Accent every day but i did search for Australian Accent because i want to be familiar with it .you are very wonderful person and i like your life . thank you dear very much. Thanks for your comment and many thanks for your kind words. I’m very pleased that you find my podcast useful. Coming to Australia to do your masters degree will be an exciting adventure for you. I’m sure you will enjoy living and studying in Australia. I too love the film Rob and think you have done a wonderful job explaining it and capturing the very essence of the characters and plot. A great post! Many thanks for your kind words. Yes, the quintessential Australian movie in my view. It’s success in Australia bears that out I think.